“Talent wins games, but teamwork and intelligence win championships.” – Michael Jordan, Former professional basketball player. 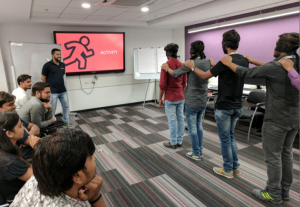 The Vistaprint Ahmedabad Training and Design Team took their game-based training approach to another level with their Working as a Team workshop, which they conducted in June 2017. With an aim to educate the workshop participants on the importance of team-work in the workplace, the team employed a mix of games, discussions and videos, which encouraged collaborative participation and candid expression. To help the participants grasp the depth and meaning of ‘team-work in the workplace’, the Training team first initiated discussions on career growth, leadership and on the strengths and weaknesses of each participant. They followed the discussions up with two fun games – the Human Knot and the Blindfolded Human Snake, for which the team used various props to create an enjoyable learning experience. During the games, the participants were challenged by being prohibited from verbally communicating with each other so that they may understand the existence of difficulties in life and in the work place. And though they were given numerous other challenges for which various solutions were offered, their learning experience enabled them to better understand several values such as trust, accountability, conflict management, proactivity and commitment. The team concluded the workshop with a screening of two videos on accountability – Tum Chalo To Hindustan Chale and Conflict Management; to instill the importance of proactive collaboration in the participants. The Human Snake game played helped me trust my colleagues better. I also learned to not depend on another person to start something but instead to take initiative which will motivate others to join me. The video shown in the workshop was good as it convinced me about the importance of collaboration. Based on the participants’ immensely appreciative feedback on the workshop, the Training and Design Team has promised to roll out similar trainings to various other departments of Vistaprint Ahmedabad as well.